Richard Schickel, a 33-year veteran of the Internal Revenue Service (IRS), is back with a new book that gives away the revenuers’ secrets. Schickel sat down with AFP to discuss the book as well as detail the tactics the IRS uses to cajole, persuade, coerce, scare, and intimidate taxpayers in order to force them to incriminate themselves. Richard M. Schickel is at it again. Fresh off the success of his first book, IRS Whistleblower: My 33 Years as an IRS Insider Will Show You the Secrets of How to Engage the IRS and Win, Richard’s latest, What to Do When the IRS Is After You: Secrets of the IRS as Revealed by Retired IRS Employees, is sure to have the IRS in a tizzy. IRS Whistleblower confirmed what many AMERICAN FREE PRESS readers have long suspected: The revenue collecting arm of the Department of the Treasury is a rogue agency that rewards the aggressive collection of taxes, encourages violation of the due process clauses of the Fifth and 14th Amendments of the Constitution, and whose agents’ range is only limited by the amount of power each one cannot grab. Click on the Listen button to hear AFP’s interview with IRS whistleblower Richard Schickel. Now, Schickel shows the reader—step-by-step—how to deal with this unfortunate fact. After serving for 33 years at the hated agency, Schickel had had enough and decided to blow the whistle and dedicate his life to teaching others the ropes. 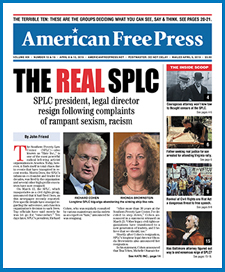 AMERICAN FREE PRESS conducted an exclusive interview with Schickel about his new book, and why it makes sense for just about every taxpayer to get a copy of it. Schickel explains in his new book that taxpayers will get tipped off that the IRS wants to get to know them better when they receive a letter in the U.S. Mail, which many are afraid to even open. It’s especially important, Schickel explained, that the letter is opened up immediately due to several factors. One of the chapters in the book discusses the Office of the Taxpayer Advocate, also known as the Taxpayer Advocate Service (TAS), which the vast majority of Americans are unaware even exists. TAS, created in 1996, is an independent office within the IRS with around 2,000 employees tasked with helping taxpayers resolve their problems with the tax collection agency. To qualify, taxpayers must experience economic harm, significant cost or a delay of more than 30 days in resolving their tax issue, or have never received a response or resolution to the problem by the date promised by the IRS. Schickel explained a bit more of their internal affairs-type function. Schickel’s been getting quite a bit of attention since his first book hit the bookstore shelves, literally and figuratively. “In the last month I got interviewed by The Wall Street Journal and The Washington Post about Donald Trump’s tax circumstances,” he revealed, where he told them maybe what they—and the rest of the corrupt mainstream media—did not want to hear. “I told them that he probably doesn’t owe any taxes, because real estate developers rarely—or never—pay taxes until years down the road, but it’s perfectly legal,” he said. This time around, it wasn’t just Schickel writing a book, as he was joined by two heavy hitters, William G. Dieken and Lauri Goff. William was an IRS senior revenue agent for 34 years, who conducted field audits on businesses and individuals during that time, and Lauri was an IRS revenue agent who retired in 2015 after 34 years with the agency. AFP asked Schickel why it makes sense for someone to get his new book. Schickel concluded our interview by offering an important piece of advice for all taxpayers who get audited.